Magic 4 Children provide childrens entertainers in Knutsford near Macclesfield in Cheshire East. Our experienced kids magicians make your birthdy party an event that will be remembered. Our children's entertainers have over 35 years of combined entertaining experienced delighting kids from age 3 to 10 years old so you are assured magic, games and a kids disco that the children will love. Magic 4 Children entertain at birthday parties, Christening and wedding reception's providing entertainment that kids enjoy, we love what we do and this reflects in the service we provide and can be seen in the smiles on the faces of the children we entertain. The Magic 4 Children 2 hour wrap round stress free party package ensure that all the kids are engaged and entertained from beginning to end, leaving you free to relax and enjoy the party. The package consists of a magician show mixed with interactive party games and a kids disco that has the children doubled over with laughter. Magic 4 Children performs all over the North West at birthday parties, in local schools and nurseries in Knutsford and surrounding areas of Macclesfield, Alderley Edge and Wilmslow. Magic 4 Children aim to provide you with an outstanding, reliable party service and ensure that your event will be a memorable one. 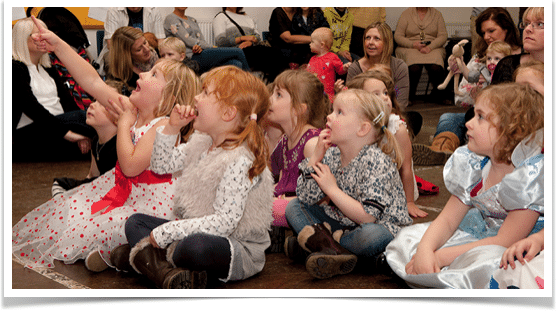 We offer advice and suggestions as to which kids entertainer in Knutsford would be best suited for your needs, whether you are holding a kids birthday party, entertaining children at a wedding, christening or having a magic show for your school fete. Get in touch for more information on our kids entertainer packages. All our kids party entertainers are experienced in entertaining children of ages 3 - 10. Our birthday magic and kids disco show include magician show, balloons, crazy comedy, dancing and a kids disco to provide the most fun for kids you can imagine. Magic 4 Children work throughout the Northwest and Cheshire and we know many of the Knutsford birthday party venues well. Our birthday shows focus the attention on the birthday child and the package is jam-packed with non-stop party fun from beginning to end. If you are looking for childrens entertainers in Knutsford that will make your party stand out from the rest then get in touch. Read here what other parents have said.